First class green striped dish cloths, 30x40cm, 100% cotton. 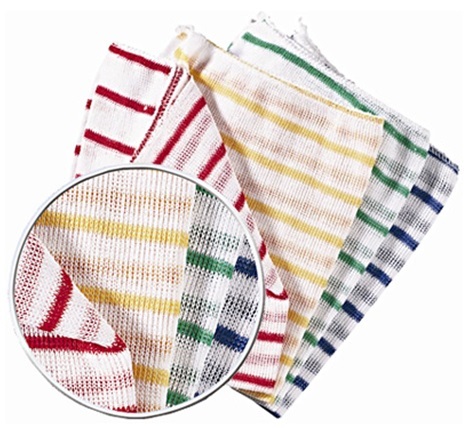 Ideal for hygiene where colour coded systems are in place, packed 10 dish cloths per polybag. Why have different colours? The aim of a product colour coding system is to help prevent cross contamination during the cleaning process. It is vital that a system forms part of an employee training programme and day-to-day working. For this system to work, you will need to assign a different colour mop and bucket. plus other cleaning equipment such as microfiber cloths to each area.